One year ago, I met face-to-face with fellow tweeter, @RogueAdventurer aka Nic Jenzen-Jones, in my hometown of Perth. And what started off as a coffee meeting in Cottesloe has grown into a rewarding and productive collaboration with a great friend over the past year. Security Scholar is the product of our passion for and interest in the security world. It is a place for Nic and I to advance our ideas while engaging with others. Starting as a few scrappy posts from yours truly, I hope it has become a useful source of information and analysis on Australia-focussed global security and military issues. First, I’d like to thank Nic for his hard work and friendship. Second, a big thanks to our readership without which we would have little reason for being. Thank you for your patience while I continue to travel through Indonesia, Thailand, and Cambodia. I have plenty of new material and insight from these travels which will shape future posts. Third, thanks to fellow bloggers, tweeters and friends who supported us, anyone who endured reading and editing my drafts, and my cats. It has been an amazing year of meeting new friends and colleagues in different parts of the world. Lastly, gratitude and much respect to those working in dangerous parts of the world, making it a safer and better place. Here’s to another year of headlines. Happy 2012! 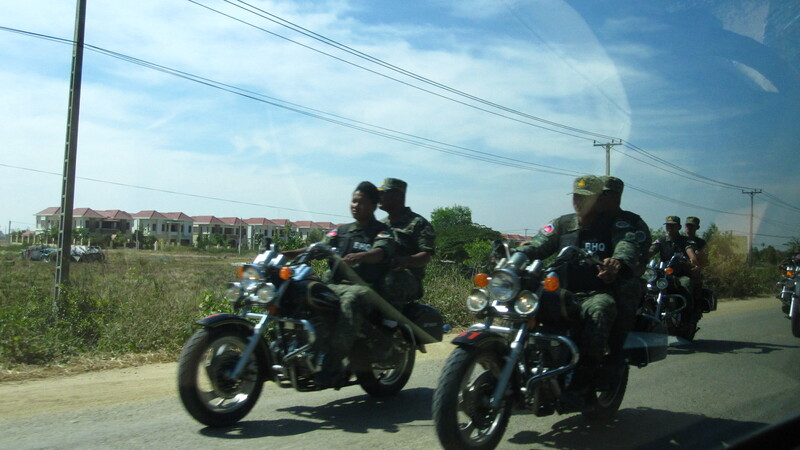 Note on the photo: While travelling in Cambodia, I noticed a large convoy of soldiers travelling by motorcyle. I quickly snapped a picture as they drove by. I was later told that these were Cambodian police, possibly coming from Hun Sen’s house. It reminded me of this.